Are you an entrepreneur intent on growing your business and engagement online? Maybe, like me, you’ve noticed how many people love taking quizzes and sharing their results on social media. So, I was intrigued when Interact contacted me to test drive their quiz creation platform. I love the Interact Quiz platform because it’s simple to use and even has a database of quizzes you can modify or use as is. There are stock photos included or you can use your own. It’s also pretty simple to add your branding and colors to the quizzes which really makes them pop. For my first quiz, I decided to take an old-school paper quiz I created last year called, “How Financial Healthy Are You?” This quiz was part of my Money is Emotional workbook and is meant to be a baseline for people to gauge the current state of their finances. I already had all of the questions, answers, and point values for the quiz, so it was just a matter of plugging them into the platform. There are three quiz styles to choose from: Scored, Personality, and Assessment. My “How Financially Healthy Are You?” quiz is an example of the Scored Quiz and is the most labor-intensive one to make from scratch. Every answer has a score value associated with it and the quiz taker will receive a score that corresponds to a certain range. Fortunately, I already had the hard work finished with the manual version of my quiz. Here’s what I learned – unless people’s scores were high, they didn’t share their results on social media. I mean who wants to admit that they’re a “Financial Flat Liner?” BUT, a low score highlights the taker’s need for my expertise and could lead them to set up a consultation or purchase my book. This is a quiz that I have all of my new financial coaching clients take when they start working with me. It’s nice to have this electronically, and not just a manual pen-and-paper quiz. The Personality Quiz will show the quiz taker what their personality type is and it’s very likely to be shared. 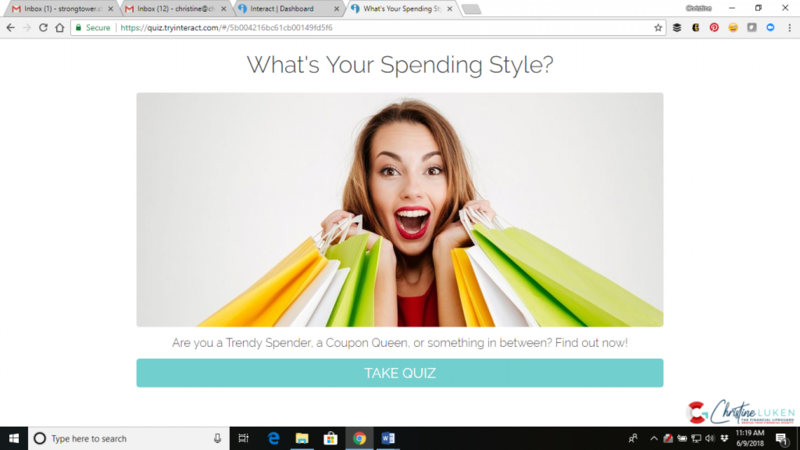 The second quiz I created was called “What’s Your Spending Style?” People learned if they were Trendy Spenders, Eco-Friendly Shoppers, Coupon Queens (or Kings! ), or Value Shoppers. The quiz results tell about the pros and cons of being this type of spender. I used this quiz as a promo to get people interested in my upcoming class, Master Your Spending. The Assessment Quiz is one that tests the takers knowledge on a certain subject. There is only one correct answer per question. This is a fun way to gauge how much your audience knows about your expertise. People who do really well will want bragging rights and share their results. People who don’t score well are made aware that they need your help! I haven’t created one of these yet, but I can see there are plenty of opportunities to test people’s money knowledge regarding debt, retirement, small business finance, to name a few. 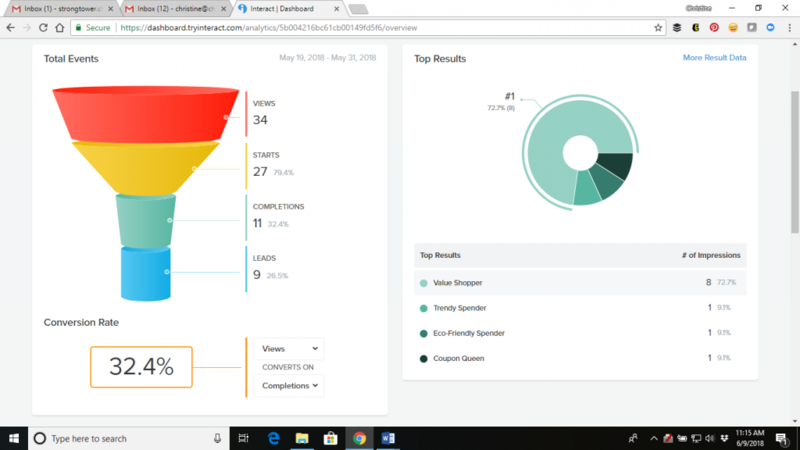 The super cool thing about the Interact Quiz platform is its ability to integrate with of email and sales funnel platforms, including the one I use, ConvertKit. Based on how people answer certain questions and their quiz results, I can tag them so they’re added to specific email lists or put into a particular sales funnel. For example, the “How Financially Healthy are You?” quiz takers who scored poorly were entered into my financial coaching funnel and the folks who scored average or above were entered into my general sales funnel. The amount and depth of data you receive from the Interact Quiz Platform is pretty incredible. You can see the number of people who viewed the quiz, started the quiz, completed the quiz, and who converted and signed up to be on your email list. You’ll also be able to see how many people shared their results on social media. You can share your quizzes a lot of different ways: on social media, as a pop-up on your website, a direct URL link, as an announcement bar on your website, as a Facebook ad, or embedded on your website or landing page. 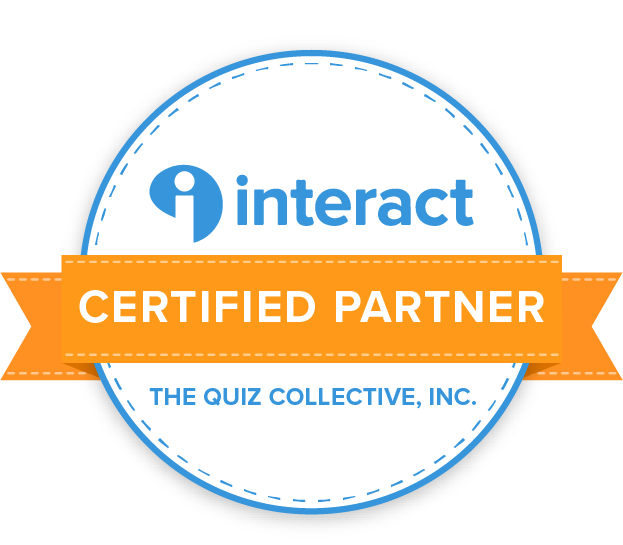 Overall, I highly recommend the Interact Quiz platform. It’s simple to use, inexpensive, creates fun and visually appealing quizzes with your branding, and their customer support is really wonderful. 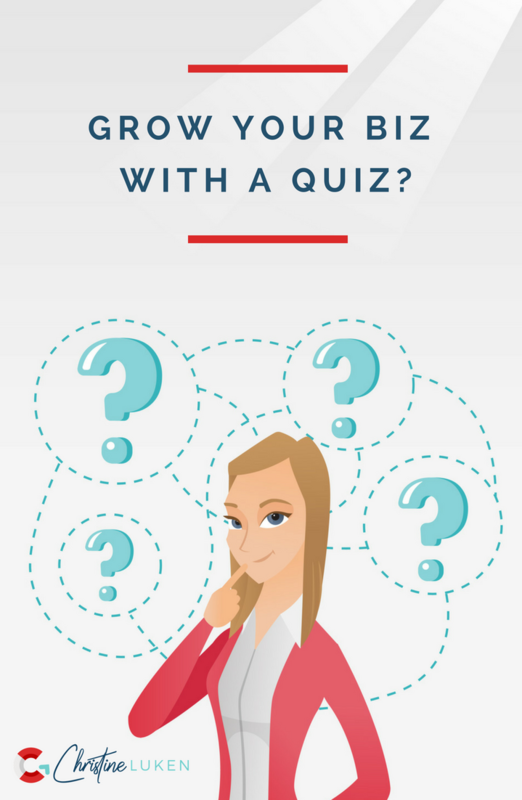 I’ve realized that you can indeed grow your biz with a quiz! Check it out for yourself HERE.